Mr. Elmer Froese as he received the 2011 Jack Buckham Award at the Fulton Cup. In the summer of 2012, our program lost someone very special. Mr. Elmer Froese was a highly respected teacher, coach and friend. 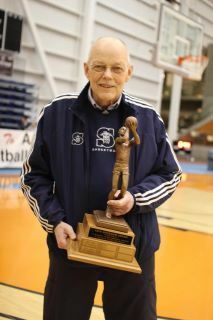 He was the founder of the Boys Basketball program, and original coach of the Senior Boys Basketball team. He was our first inductee to the "Sa-Hali Sabres - Wall of Honour".